WASHINGTON – So-called school “reformers,” bent on closing “failing” schools, ignore “the elephant in the room,” poverty, that accounts for poor student performance, American Federation of Teachers President Randi Weingarten says. Speaking in mid-October to an Economic Policy Institute forum, the teachers union head also challenged a right wing myth, and a right wing goal: That most public schools are failing and that education should be turned over to the private sector, and that tests should be the exclusive measure of a school’s and a teacher’s effectiveness. Instead, she said, studies and comparisons with the U.S. “peer group” of developed nations show improvements in students’ learning across the board in the last two decades. The catch is that the improvements are uneven, with schools that sit in high-poverty areas still trailing behind. 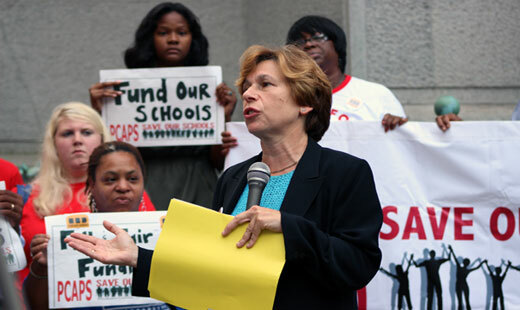 Weingarten was one of several panelists who challenged the prevailing mythology about schools, including the teach-to-the-test goals the right wing has imposed on U.S. schools, starting with anti-worker and anti-public teacher President George W. Bush’s No Child Left Behind law in 2001. 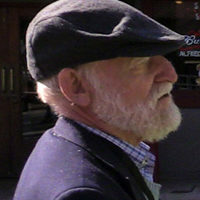 Both the AFT and the nation’s other teachers union, the National Education Association, strongly criticized the law. At one point NEA and its Michigan affiliates sued to stop it, saying Congress promised funds for improvement if schools would follow the law’s dictates, but didn’t provide the money. NEA lost. “The other side starved the schools – especially those schools that need help the most – and then they say that the schools are failing and parents deserve more. So the only alternative they push is their schemes: Cyber schools, charters and vouchers,” Weingarten said. Studies show those alternatives don’t work. The difference now, as Congress considers updating basic federal education law – including Bush’s law – is that parents are joining the anti-No Child Left Behind crusade, Weingarten told a packed house at EPI. Parents, she said, will march against No Child Left Behind nationwide on Dec. 7-8. Intellectually, Diane Ravitch, a former “reformer” whose two books about the state of the nation’s schools slam not just Bush’s law but the “alternatives”-charters, home schooling, and federal cash to parents of private school students – provides them heft. Ravitch has credibility in the fight because she’s a former U.S. Education Department official herself and a longtime school “reform” activist in New York. Her books, which she discussed at the session with Weingarten and other speakers, show there is virtually no difference in performance by students in charter schools nationwide and in more traditional public schools. And the public schools in poverty-stricken areas can be improved with more targeting of money and with more services to treat the students, not just teach them, Ravitch said. The reformers ignore the evidence and “double down” on failed solutions that load the entire responsibility on teachers for troubled schools, Weingarten added. But there is a more comprehensive solution to the problems those schools face, she declared: Turn schools into community centers providing not just teaching but a wide range of services – from meals to health care to enrichment programs – that benefit the child as a whole. Weingarten’s model is the early 20th century settlement houses that provided an entire range of services to new immigrants. “Let’s do wraparound services,” such as the AFT local and the Cincinnati public schools have constructed, she said. “The schools would be a place to go for children to get the entire range of services they need – and that their families need, too. And then let’s put in an accountability system, not just testing, to ensure the services get to the kids and that they work. “And schools, unions, teachers and families should go ahead with such plans without waiting for federal prodding or funds,” Weingarten said. “That’s because, in the current political climate, “there will be no re-upping” of the Elementary and Secondary Education Act – which sends federal funds to schools – or No Child Left Behind, either. “Let’s figure out what to do to open the system and its accessibility, so that once and for all, we stop the stupidity of kids being trained to be test-takers,” she ended.